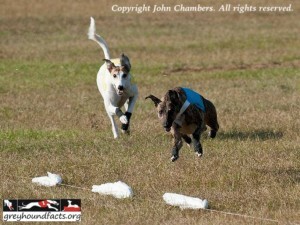 I initially learned about lure coursing when I had my first sighthound, an Italian greyhound. I read about it online and in discussion forums and found it intriguing, but was never able to participate with my IG for a number of reasons. When I got my first greyhound, Willow (Wilma Waggle), I started taking her to lure coursing trials and she loved it. I’ve also lure coursed with my adopted whippet and my second greyhound. Wiki (Wiki Hard Ten), my second greyhound only lure coursed for a short period because he kept getting toe injuries. My third and most recent greyhound doesn’t lure course (yet?) because he’s too shy and I don’t trust him off leash in an unfenced area, which is most lure coursing fields. I also have a young whippet who I will eventually lure course with, but for now, we’re focusing on amateur racing, which is what she’s bred for. For someone interested in getting started in lure coursing, the ASFA and AKC websites are a good place to start (links below). I believe it’s also important to find a club and a mentor who are experienced in lure coursing with greyhounds. As an athletic activity, there is always some risk of injury, and having a good mentor and a club that is experienced running greyhounds can help a newbie take the proper safety precautions to reduce the risk of problems.